← See the Light – Be a Better Dentist! OK, nothing revolutionary here. Many of you may have done cases like this. But, maybe some haven’t. Patient is a 90 y.o. male. He broke a big chunk of porcelain off a screw-retained 3-unit bridge, #19 – 21. The fracture was on #21, taking most of the facial and mesial porcelain off. This left what would be a big food trap on the mesial of #21, not to mention rather unsightly metal exposure in a semi-cosmetic area of the smile. Together, we decided a repair was a conservative approach. I explained that the worst thing that could happen is it didn’t work, and we’d be back where we started. Then, I winked at him and said, “But, it will work.” I’ve done these before with no failures to date. I prepped the abutment, removing most, but not all, of the porcelain. Imagine a 3/4-crown prep with the open side facing the connector to the pontic. I just prepped to create a path of draw and enough room for an all-ceramic (porcelain fused to zirconia) restoration. I forgot to get a pre-op photo, so what you’ll see here starts after I prepped it. Prepped abutment. You can see the screw access, filled with composite. Click on image to see larger version. Luxatemp provisional cemented with TempBond. Lab models. Click on image to see larger version. Crown back from lab. Click on image to see larger version. 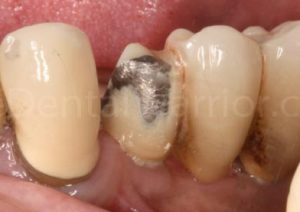 Overcrown cemented with Unicem. Click on image to see larger version. That’s it! Nothing complicated. A nice conservative service for a long-time, very nice 90 y.o. patient (who you would think is in his 70s). This entry was posted in Case Presentation, Clinical Technique and tagged Dr. MacGyver, implant bridge repair, overcrown. Bookmark the permalink. I have never seen that done before. Great thinking, great approach. What did you use to seat crown? Mike nice job, sure the patient was thrilled. But did you say this was screw retained? was there any thought to just unscrewing it and sending it back to the lab for repair. I have done that in the past. I am not the sharpest tack(and it is Saturday morning 🙂 ) so maybe I am missing something. Really enjoy your Dental Warrior. Nice to see regular pointers from someone in the trenches. That did occur to me… admittedly, later. I would have had to order cover screws for the mean time. That said… I believe that, because the bridge has been in his mouth for so many years, they’d have to strip ALL the porcelain and re-do it. Something to do with moisture absorbing into the porcelain… I don’t think you can just throw more porcelain on it and bake it. I believe this is a simpler solution. Nice work; the result should be as good or better than new. I’ve done this a few times, most recently using Cerec and EMax for a same-day finish. I love the instant gratification for both the patient and myself. The most common obstacle is that many broken PFMs, especially when tooth supported, have inadequate occlusal clearance to allow sufficient thickness of material. True about having ROOM for this. Back in the day, when all we had was PFM, we’d simply not have the room in most cases… stacking a PFM over an existing metal coping. But, now with PFZ (porcelain fused to zirconia) or even monolithic zirconia, it’s rarely an issue. This comment is long overdue to thank you for posting these photos. I never knew of this treatment option. I was going to ask about what cement you used, but it was answered in the comments. Great comment Mike, it is a good technique that you are implementing here. 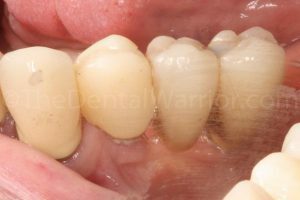 I think repairing was the best shot for this dental patient. Thanks for sharing and photos. I’ve never seen that done before. Thanks for sharing and pictures. This is a good idea, specially given the patients age, but I think it can also be used in some other cases. Thank you for sharing this different approach to a common problem.